When you work on a new label project it's important to let your label printing vendor and designer know the environment the label will have to withstand. Will it need to perform well outdoors? Will the label be stored in a freezer or damp environment? This will help them determine the best material for your application. It's especially important if your label is regulated or if your label is part of the primary packaging. A label should look great for the entire life cycle of your product. Today we're going to talk about selecting the right labels for High Pressure Processing or HPP. HPP is a process of pasteurization typically used in the food, beverage and pet food markets to keep the food fresh longer. Because there is a breakdown in nutrients during heat pasteurization, it's believed that HPP maintains the integrity of the nutrients because there is no heat used in this process. To illustrate this process, let's use our friends at PureSpoon. 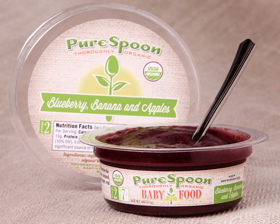 PureSpoon creates organic pureed food that is sold at Whole Foods. On their label they say, "We use pressure instead of heat to pasteurize which doesn't destroy the flavor or nutrition naturally found in our nutrient-packed, steamed, organic ingredients." It's very important to this brand that they use HPP and have a quality label to help market their products. Food and beverages that go through this process are packed and sealed before they go through the HPP system. This greatly reduces contamination. In the HPP system, the packaging and its contents are subjected to hydorstactic pressure up to 600 MPa / 87,000 pis. Because the food goes through this process when it's sealed, it's important to select a label material that can withstand this pressure and perform in a wet environment. This is even more important for primary package labels that need to act as branding material on the shelf. Correct barrier properties such as OTR, MVTR and UV of the package are critical. And the design of the package is also important to prevent damage and optimize throughput through the HPP process. Also, all HPP products are in the refrigerated world so the label must stick in a cold damp place. The three key advantages that hold true for all HPP-treated products are: food safety to inactivate pathogens such as listeria, E. coli, and salmonella; added shelf life to increase distribution possibilities and decreases costs; and the ability to introduce new products, for example, clean-label foods. What is the ideal label material for HPP? Weber has a large catalog of vinyl/film label materials that will hold up during this process. We also recommend a laminate to ensure that your beautiful label design stays completely intact through this process and during the entire life of the product. These materials can be printed on one of our HP Indigo digital label presses with minimums as low as 1,000 and our high volume Mark Andy flexo presses for when you need 100,000+ labels. If this is a process your products go through now, or will in the future, request high pressure processing labels for testing.